The San Jamar SI7000 Saf-T-Scoop® Guardian™ system can hold 12 to 16 ounces. Germ Guards™ are built onto the scoop to prevent contamination. 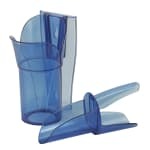 Since the scoop is domed, ice can quickly be scooped and will not easily spill. Balance and comfort are provided when scooping since the handle has an angled design. Constructed of polycarbonate, the San Jamar SI7000 Saf-T-Scoop Guardian system resists breaking and is heavy duty. The Guardian holder can be mounted on the interior or exterior of the unit with the included hardware.